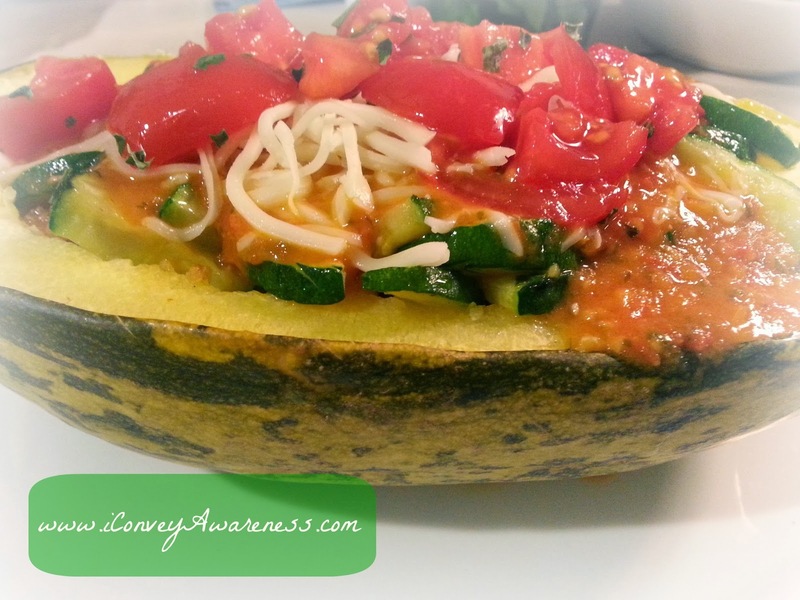 Want a filling and nutrient dense dinner idea? 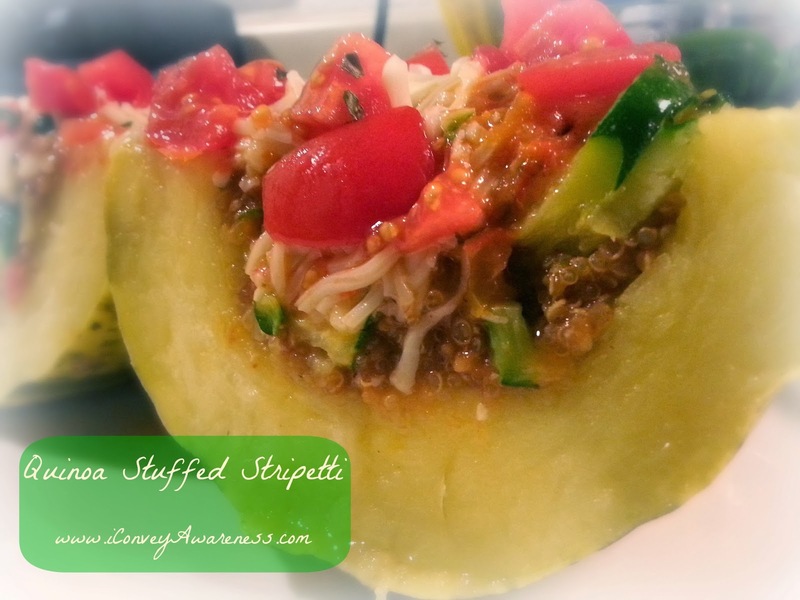 Try stuffed stripetti! It's vegetarian and gluten-free. You can omit dairy. Not knowing what to do with my stripetti squash, I considered my background in culinary acts of goodness. Yeah, I'm a 'wing-it' kind of chef! I was more than pleased with the outcome of this dish! 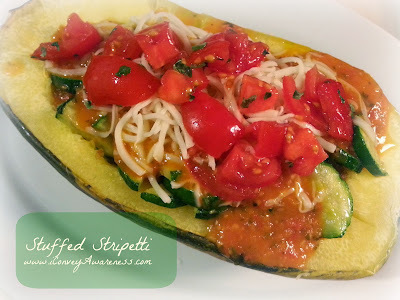 A stripetti's appearance resembles a watermelon but its texture is similar to that of a spaghetti squash and its flavor closer to sweet potatoes. Sounds intriguing, yes? YES!! After doing some research on how to prepare, I learned the best way was to bake it on 375* for 45 minutes in its wholeness - not cutting, piercing or anything. Just put it in a dish with a little bit of water and roast. It's a bit tough to work with if you avoid this necessary step. While your stripetti is roasting, let's prepare the filling. I used no animal protein in this recipe. Instead I used quinoa. More info about this fabulous grain here. 1) Quinoa cooked in your own vegetable stock (as seen here) + 1 tsp cumin + 1/4 tsp cayenne; mix and cook covered (follow directions on package). 2) Zucchini (any green vegetable you'd like!) in a quick stir-saute with 2 T EVOO, 1/2 tsp minced garlic, and 1/2 tsp basil. 3) 8 oz of spaghetti or tomato sauce (or yours done here). 4) 8 oz diced tomatoes (choose fresh) marinated in 1/4 tsp EVOO, 1/2 tsp basil, and 1/8 tsp sea salt. When stripetti is done roasting, wait for it to cool slightly then cut it lengthwise. Remove seeds with a spoon. This recipe packs flavor. I'm glad I had my own tomato sauce on hand because I believe it gave it a step up in deliciousness! Experiment with different vegetables - add more! Some options: Broccoli, Purple Cauliflower, Spinach! Have fun with it!